SNICKERS’ new 360 campaign kicks off on TV, digital, social and public relations in January. At the centre of the campaign lies the brand’s latest 2019 innovation — new Creamy SNICKERS — now available nationally in Almond Butter, Peanut Butter and Maple Almond Butter. The new Creamy SNICKERS Bars feature everything fans love about the Mars-owned brand – gooey caramel and a milk chocolate coating – with the addition of freshly ground, creamy nut butters. 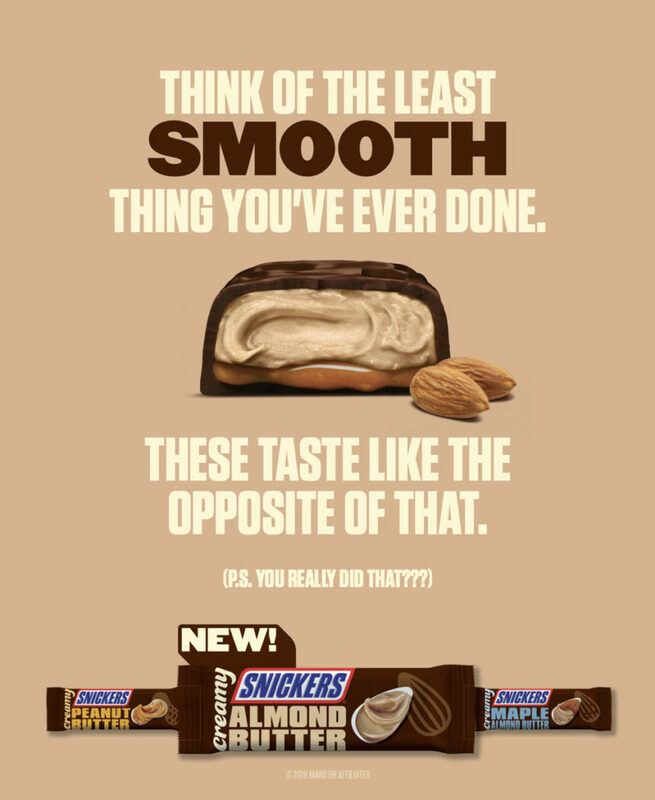 As a twist to the ubiquitous “You’re Not You When You’re Hungry” campaign, SNICKERS is reminding fans that they’re also not smooth when they’re hungry. Created by BBDO New York, the work to support the brand’s newest innovation includes “Heist,” which kicked off on February 3 as part of Sunday’s NFL Countdown. The remaining TV (“Lame”) and OLV (“Unsneaky,” “Hood Slide”), kicked off February 4, and all creative will run nationally in the US through 2019. Print will run in a variety of national publications, including US Weekly, People, Entertainment Weekly, Sports Illustrated, Real Simple, Game Informer, GQ and Taste of Home. 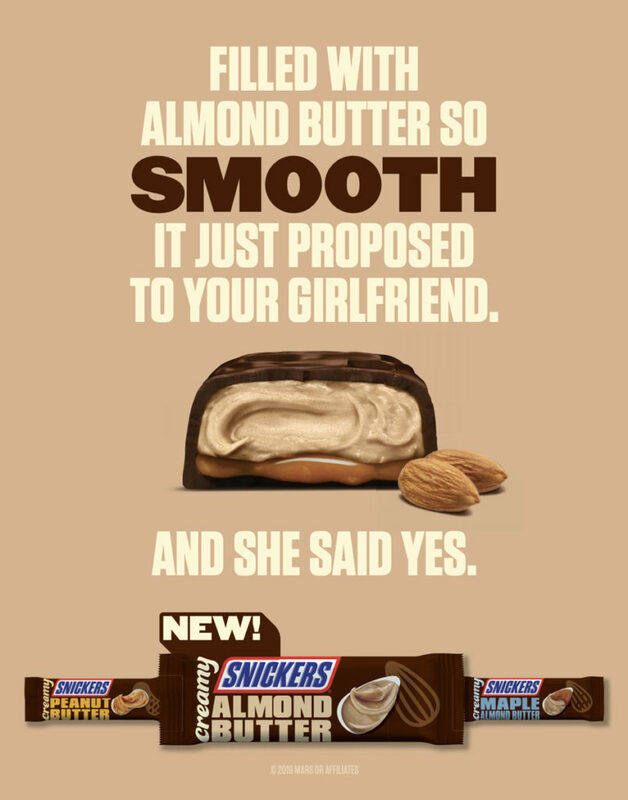 On the heels of the new ad creative launch, the Creamy SNICKERS #SmoothItOver PR and social campaign will kick off on February 15, 2019, inserting the new product into the cultural conversation around consumers’ most “unsmooth” moments, beginning with Valentine’s Day. On the day after Valentine’s Day, throngs of significant others will be reeling from orchestrating an un-smooth Valentine’s Day ending in “nomance” instead of romance. On February 15 only, fans will be able to #SmoothItOver with the chance to give unique Creamy SNICKERS-infused flower bouquets to their boo, best friend or gal pal. Fans in New York City and Los Angeles can claim their free bouquet by tweeting: @SNICKERS #SmoothItOver + [chocolate emoji], while supplies last.